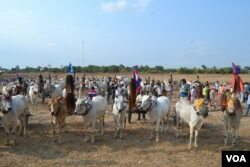 Hundreds of oxcart racers and onlookers gathered in the parched rice fields of Kampong Speu province’s Samroang Tong district on Sunday for Cambodia’s annual new year oxcart races. The three-day event included dozens of competitors and is held each year to mark the end of the rice harvesting season. Many farmers in Cambodia continue to rely on traditional methods involving oxes and plows, but more farmers are adopting modern agricultural methods and tools. Sroy Samreth, 37, from Roka Koh commune in Kong Pisey district, said he hoped his participation in the race would draw attention to traditional farming practices. “This is to preserve traditions. We use cows and oxcarts in our farming. We normally celebrate this race for Khmer New Year,” he said, adding that traditional farming methods were more profitable than using modern machinery. 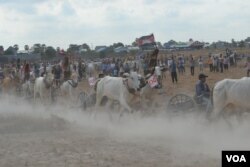 Leaning on nearby oxcart, another racer, Seth Pearun, waits stick in hand for his turn. The 45-year-old farmer also expounds on the benefits of traditional farming and the importance of cattle in Cambodian agricultural life. “I grew up with cows, after school, I took care of them, my father was a trader and I love cows,” he said. Historically oxcarts were widely used in Cambodia for transport, but modern technology has largely replaced the oxcart. Kampong Speu’s deputy governor, Sar Soputhra, said the races, held annually over the past five years in the province, were vital to promoting traditional culture in the area. As the race continued, hundreds of participants watched the race under the swealtering sun. She added that many of villagers in nearby Rolaing Kroeul commune still use oxcarts and cows for farming. “Now, some people turn to use homemade trucks for plowing their farms, but there are some who still use cows,” she said. Using traditional rice cultivation methods produces more hay to feed the cows, she said, compared to using machinery.